The term ‘restomod’ really isn’t appropriate here. The car you see in these images is - for all intents and purposes - a brand new 993 911 Turbo S, built not by a third party, but by Porsche itself. The one-off creation is based around an original 993 shell and has been built up over the course of a year and a half using 6500 genuine Porsche Classic parts. The engine? That’d be an - also brand new - 3.6-litre twin-turbo flat-six, making 444bhp. Yep, the exact same figure as the original. The same people from Porsche Exclusive Manufaktur behind the 911 Turbo S Exclusive were in charge of the exterior finish. 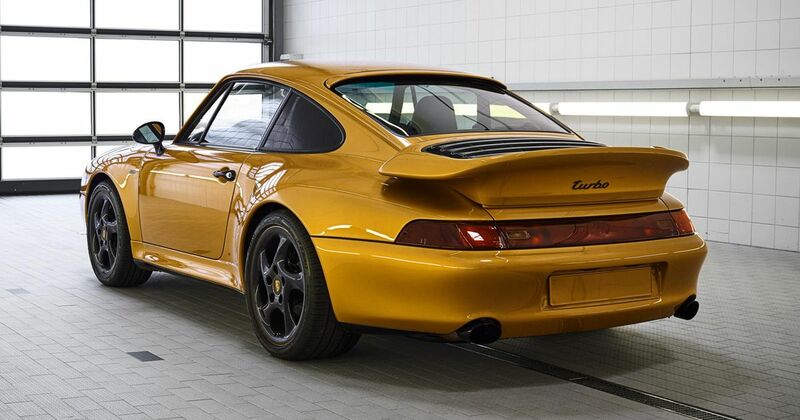 Curiously, rather than opt for an original 993 colour, the car has been painted in the same rather conspicuous ‘Golden Yellow Metallic’ hue as the limited-run Exclusive. Hence, it’s been christened ‘Project Gold’. The hollow-spoke aluminium wheels are initially painted in the same colour, before being given a top coat of black. This was partially removed with a laser, giving each rim a pair of accent rings. On the inside, you’ll find more gold detailing in the form of contrast stitching for the black leather trim. The leather - by the way - is all the work of Porsche Classic’s “dedicated saddlery”. Yep, they have one. At this point, we’d normally note the absence of a price tag, with the old “if you have to ask…” adage. But here’s the thing - this isn’t a commission from an ultra-rich collector. Nope, it was Porsche’s decision to make the thing, and it’s heading for the auction block. So while we won’t know exactly how much money Stuttgart sunk into it (let’s assume a lot), we will know how much it’s going to set back the eventual owner. So, anyone want to have a guess of where the bids will reach when the hammer falls?